We have been blessed with some PADs - Perfect Adirondack Days - this Spring, but yesterday was one of the best. The afternoon trail running at wildflower mecca, Mount Van Hoevenberg, was phenomenal. Some famous wildflower stars made their 2009 debut including the yellow, purple and white violets, and Red Trillium. 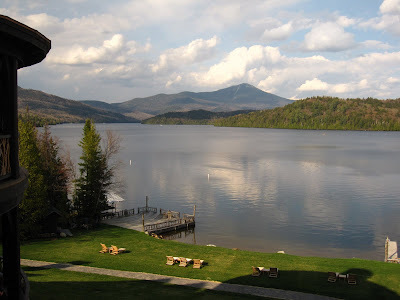 The evening yoga session on the dock at the Lake Placid Lodge was the icing on the cake. As you can see in today's photo, it is not a bad spot to spend 90 minutes stretching and relaxing.